Considered to be the "Prince" of Italian charcuterie products. It is a matured product made from by Delta toolbar" in_rurl="http://s.ltmmty.com/click?v=R0I6NjkwMDk6MTc0OnNlbGVjdDo1YzQyYmJkYTBmNTRjOTVkNTA4NTc3Y2U3YzUwOTU2NDp6LTEzMTAtNDEwODg5MTM6d3d3LmZpbmVmb29kc2UxLmNvLnVrOjIwNjU4MTowZTI0YmNjYzI3MDZjZmJhNTIwZTMyMGI2N2ZmNzExZDpjMjQ2ZDZhN2I3ZTk0MWE3ODVmZTFjYjJlZTA2NjFjOToxOmRhdGFfc3MsOTAweDE1Mjg7ZGF0YV9mYixubztkYXRhX2l0bl90ZXN0LDIwMTUwNDMwX2M7OjQ0MjE3MTk⊂id=g-41088913-9b60f3cc510443729bcc11001aa5e368-&data_ss=900x1528&data_fb=no&data_itn_test=20150430_c&data_tagname=P" id="_GPLITA_0" href="#">selected pork legs, coming from pigs having weights ranging from 160 and 180 kg (the so-called "heavy pigs"). It is elongated and pear shaped; its internal colour is more or less rosy, uniform and edged by a fat layer. The aromas is fragant and the taste is delicate yet flavourful and faintly salty. 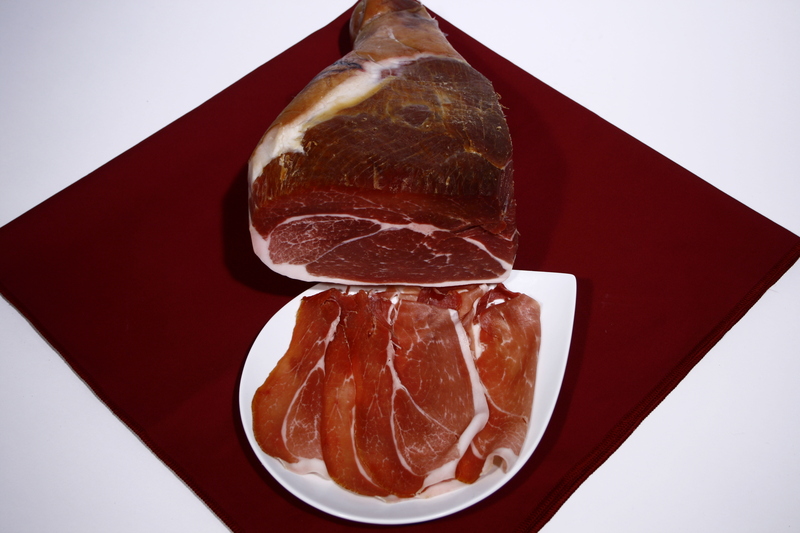 The only ingredients used in the processing of cured hams are pork legs, salt and thyme. The minimum by Delta toolbar" in_rurl="http://s.ltmmty.com/click?v=R0I6NjkwMDk6MTc0OnB1cmNoYXNlOjVlMjg3MGYxODJjMDliYmM1MjY3MWY0NGY4Njc5ZTliOnotMTMxMC00MTA4ODkxMzp3d3cuZmluZWZvb2RzZTEuY28udWs6MjA2NTgxOjBlMjRiY2NjMjcwNmNmYmE1MjBlMzIwYjY3ZmY3MTFkOjdmZjFkNDg2ZTYwNjRhNzJhYjRlMmIyN2YwNjkzYTJlOjE6ZGF0YV9zcyw5MDB4MTUyODtkYXRhX2ZiLG5vO2RhdGFfaXRuX3Rlc3QsMjAxNTA0MzBfYzs6NDQyMDc4NQ⊂id=g-41088913-9b60f3cc510443729bcc11001aa5e368-&data_ss=900x1528&data_fb=no&data_itn_test=20150430_c&data_tagname=P" id="_GPLITA_3" href="#">purchase of this product is 200 g.